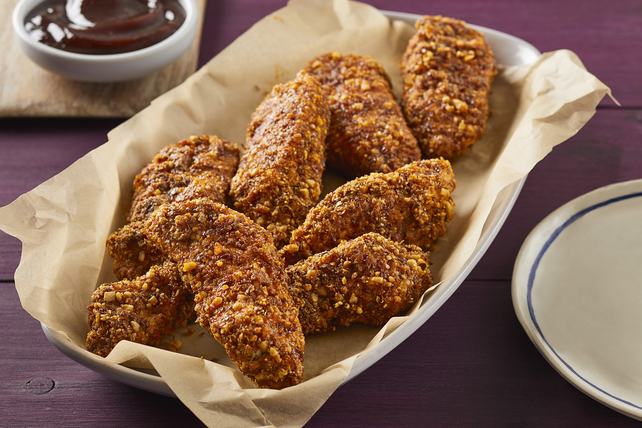 The almonds and flax seed team up to make a crunchy coating for this delicious baked chicken. With their crunchy coating and nutty flavour, these chicken tenders are sure to become a new family favourite. Cover baking sheet with foil; spray with cooking spray. Whisk eggs and mustard in shallow dish until blended. Combine all remaining ingredients except chicken in separate shallow dish. Dip chicken, 1 strip at a time, into egg mixture, then into nut mixture, turning to evenly coat both sides of each strip with each ingredient. Place on prepared baking sheet. Bake 15 min. or until done. Covering the baking sheet with foil before using it to bake the chicken strips makes cleanup a snap. Serve with Heinz Tomato Ketchup for dipping.